Akbarinejad, V., Tajik, P., Movahedin, M., Youssefi, R. (2017). Effect of extracellular matrix on testosterone production during in vitro culture of bovine testicular cells. Veterinary Research Forum, 8(1), 7-13. Vahid Akbarinejad; Parviz Tajik; Mansoureh Movahedin; Reza Youssefi. "Effect of extracellular matrix on testosterone production during in vitro culture of bovine testicular cells". Veterinary Research Forum, 8, 1, 2017, 7-13. Akbarinejad, V., Tajik, P., Movahedin, M., Youssefi, R. (2017). 'Effect of extracellular matrix on testosterone production during in vitro culture of bovine testicular cells', Veterinary Research Forum, 8(1), pp. 7-13. Akbarinejad, V., Tajik, P., Movahedin, M., Youssefi, R. Effect of extracellular matrix on testosterone production during in vitro culture of bovine testicular cells. 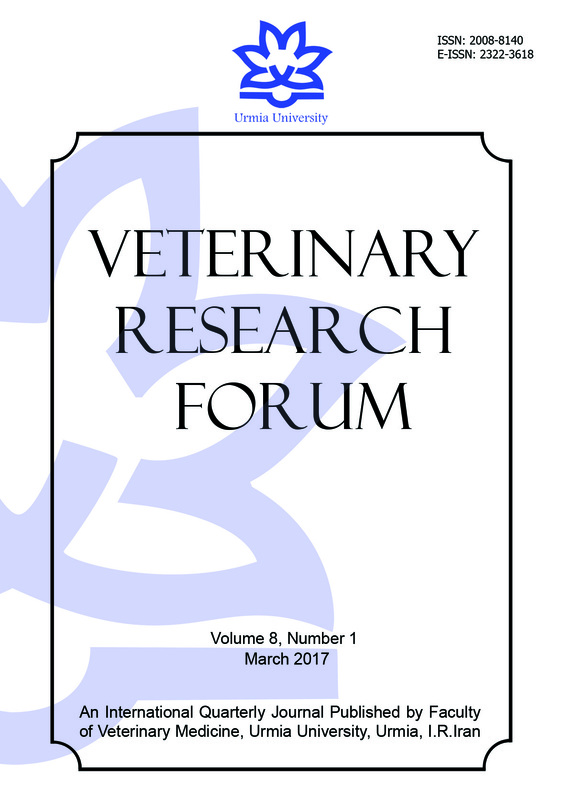 Veterinary Research Forum, 2017; 8(1): 7-13. Testosterone is believed to play a significant role in spermatogenesis, but its contribution to the process of spermatogenesis is not completely understood. Given that extracellular matrix (ECM) facilitates differentiation of spermatogonial stem cells (SSCs) during culture, the present study was conducted to elucidate whether testosterone contribute to the permissive effect of ECM on SSCs differentiation. 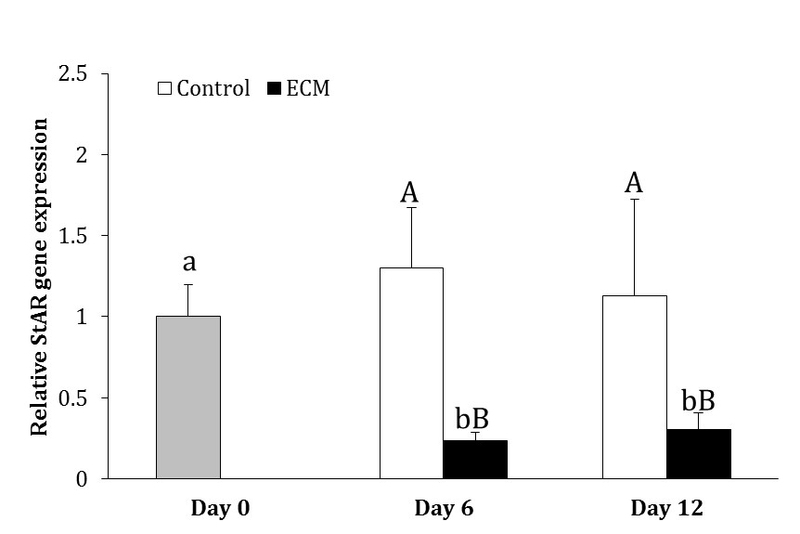 In experiment 1, testosterone production was measured in testicular cells cultured for 12 days on ECM or plastic (control). 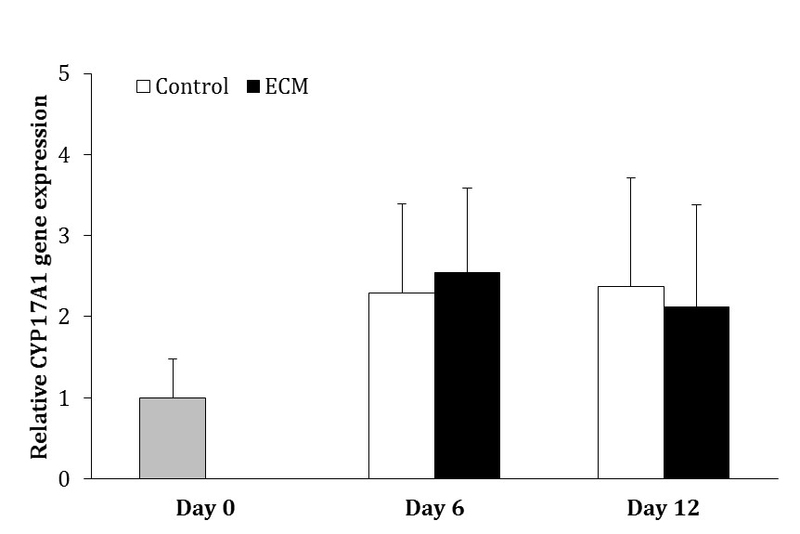 In experiment 2, testosterone production was assessed in testicular cells cultured on ECM or plastic (control) and exposed to different concentrations of hCG. In experiment 3, the gene expression of factors involved in testosterone production was analyzed. Testosterone concentration was lower in ECM than in the control group in experiment 1 (p < 0.05). 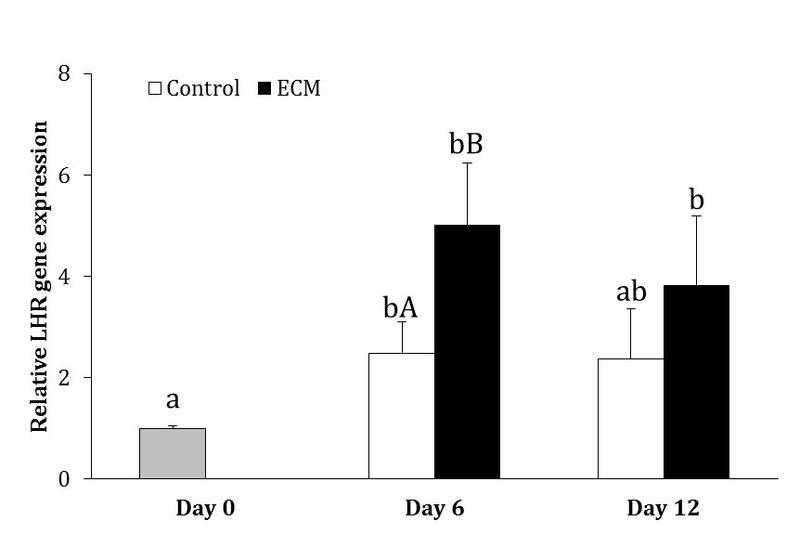 In experiment 2, testosterone concentration was increased in response to hCG in both groups but cells cultured on ECM were more responsive to hCG than those cultured on plastic (p < 0.05). In the experiment 3, qRT-PCR revealed the inhibitory effect of ECM on the gene expression of steroidogenic acute regulatory protein (StAR) (p < 0.05). Nevertheless, the expression of LH receptor was greater in ECM-exposed than in unexposed cells (p < 0.05). In conclusion, the present study showed that inhibiting the expression of StAR, ECM could lower testosterone production by Leydig cells during in vitro culture. In addition, the results indicated that ECM could augment the responsiveness of Leydig cells to hCG through stimulating the expression of LH receptor. In the previous studies investigating the effect of ECM on SSCs differentiation, the impact of ECM on the potential contribution of testosterone in terms of SSCs differentiation has not been assessed.23-25 Therefore, the present study was conducted to address whether testosterone contribute to the differentiating effect of ECM on SSCs during in vitro culture. Animals and testicular biopsy. Animal Ethics Committee at University of Tehran approved the present study in terms of animal welfare and ethics. Testicular biopsies were obtained from Holstein calves (n = 17; aged 3 to 5 months) as previously described.23 In brief, testicular biopsy was performed under sedation with xylazine (0.20 mg kg-1; Alfasan, Woerden, Holland) and local anesthesia with lidocaine (Aburaihan Pharmaceutical Co., Tehran, Iran). Following incision, the testicular tissue was obtained and placed into a 15 mL tube containing Dulbecco' minimal essential medium (DMEM; Gibco, Carlsbad, USA) with 10% fetal bovine serum (FBS; Sigma-Aldrich, St. Louis, USA) and antibiotics (100 IU mL-1 penicillin and 100 µg mL-1 streptomycin; Gibco). Following testicular biopsy, the specimen was transferred on ice to the laboratory within 2 hr. Cell isolation. Cell isolation was implemented using a two-step enzymatic isolation procedure.23 The testicular tissue was washed three times in DMEM containing antibiotics and was minced into small pieces using a sterile scissor. The minced testicular tissue was incubated in DMEM containing 1 mg mL-1 collagenase (Sigma-Aldrich), 1 mg mL-1 hyaluronidase (Sigma-Aldrich), 1 mg mL-1 trypsin (Sigma-Aldrich) and 5 µg mL-1 DNase (Fermentas, Waltham, USA) at 37 ˚C in a shaker incubator with 80 cycles per minute for approximately 60 min. The digested testicular tissue was washed three times with DMEM and the supernatant was disposed after each washing, leading to isolation of seminiferous tubules. During the second step of enzymatic digestion, seminiferous tubules were incubated at 37 ˚C in DMEM containing 1 mg mL-1 collagenase, 1 mg mL-1 hyaluronidase and 5 µg mL-1 DNase until disintegration of the seminiferous tubules and separation of the constituent cells. Individual cells were isolated from the remaining tubule fragments by centrifugation at 30 g for 2 min. Following filtration through 77 and 55 mm nylon filters, the cells were pelleted. The pellet was re-suspended in the DMEM containing antibiotics and 10% knock-out serum replacement (KSR; Gibco). Testosterone concentration analysis. Testosterone concentration was measured by direct, competitive, chemi-luminescence immunoassay kit (DiaSorin, Stillwater, USA). Table 1. Primer sequences used for qRT-PCR. a LH receptor; b Steroidogenic acute regulatory protein. Statistical analysis. Initially, datasets were tested for normal distribution using Kolmogorov-Smirnov test (univariate procedure). Data associated with testosterone concentration in experiment 1 were log (base 10) transformed prior to analysis because of the lack of normal distribution. Data were analyzed using mixed procedure including random and repeated statements in the model to specify co-variation between and within calves respectively.33 In addition, LSMEANS statement was used to perform multiple comparisons. All analyses were conducted in SAS (version 9.2; SAS Institute, Cary, USA).Data are presented as mean ± SD. Differences with p < 0.05 were considered significant. Experiment 1. Testosterone concentration was higher in the control than ECM group on days 6 and 12 of culture (p < 0.05). However, the production of testosterone was not different between days 6 and 12 in the control and ECM groups (p > 0.05; Table 2). Table 2. Testosterone concentration (ng mL-1) in control and extracellular matrix (ECM) groups on Days 6 and 12 of culture. Data are presented as mean ± SD. ab Different superscripts indicate significant differences within each column (p < 0.05). Experiment 2. In the control group, testosterone concentration in cells cultured with 10.00 ng mL-1 hCG was greater than that in cells cultured with 0.00 and 0.10 IU mL-1 of hCG (p < 0.001). However, the concentration of testosterone did not differ among 0.00, 0.10 and 1.00 IU mL-1 concentrations of hCG and between 1.00 and 10.00 IU mL-1 concentrations of hCG (p > 0.05; Table 3). In ECM group, testosterone concentration in 10.00 IU mL-1 hCG group was greater than that in 0.00, 0.10 and 1.00 IU mL-1 hCG groups (p < 0.05). In addition, testosterone concentration was higher in 1.00 IU mL-1 hCG group than 0.00 and 0.10 IU mL-1 hCG groups (p < 0.05). Testosterone concentration was not different between 0.00 and 0.10 IU mL-1 hCG groups (p > 0.05; Table 3). Table 3. Testosterone concentration (ng mL-1) in control and extracellular matrix (ECM) groups following exposure by different levels of hCG. Data are presented as mean ± SD. abc Different lowercase superscripts indicate significant differences within each row(p < 0.05). AB Different uppercase superscripts indicate significant differences within each column (p < 0.05). Experiment 3. In the control group, the gene expression of LHR on day 6 (2.47 ± 0.62 fold) was higher than that on day 0 (p < 0.05); however, LHR expression on day 12 was not different from days 0 and 6 (p > 0.05). In ECM group, the expression of LHR on days 6 (5.00 ± 1.23 fold) and 12 (3.81 ± 1.38 fold) was greater than that on day 0 (p < 0.01), but it did not differ between days 6 and 12 (p > 0.05). On day 6, the gene expression of LHR was higher in ECM than the control group (p < 0.05), but it was not different between two groups on day 12 of culture (p > 0.05; Fig. 1). The gene expression of CYP12A1 did not change over the course of culture in the control and ECM groups (p > 0.05) and it was not different between two groups on days 6 and 12 (p > 0.05; Fig. 2). In the control group, the expression of StAR did not change during culture (p > 0.05). In ECM group, however, the expression of StAR was 77.00% and 70.00% lower on days 6 and 12, respectively, as compared to day 0 (p < 0.05). The expression of StAR in ECM group was lower than that in the control group on days 6 and 12 (p < 0.05; Fig. 3). Fig. 1. Relative gene expression of LHR in the control and ECM groups (n = 3) on days 6 and 12. Lowercase letters (a and b) indicate significant difference within groups between different timepoints (p < 0.05). Uppercase letters (A and B) indicate significant difference between two experimental groups at the specified timepoint (p < 0.05). Fig. 2. Relative gene expression of CYP17A1 in the control and ECM groups (n = 3) on days 6 and 12. No significant differences were noted among the groups. Fig. 3. Relative gene expression of StAR in the control and ECM groups (n = 3) on days 6 and 12. Lowercase letters (a and b) indicate significant difference within groups between different time points (p < 0.05). Uppercase letters (A and B) indicate significant difference between two experimental groups at the specified time point (p < 0.05). The present study revealed that ECM decreased the production of testosterone by Leydig cells during in vitro culture. Culturing testicular germ cells of rat on ECM for 22 days, Lee et al. reported differentiation of germ cells up to haploid cells.24 The same observation was indicated when ECM was applied for culture of human testicular germ cells.25 More recently, culturing bovine SSCs on ECM for a 12-day period, Akbarinejad et al. found evidence for the initiation of SSCs differentiation. This phenomenon was not observed following culture of SSCs on plastic.23 On the other hand, giving mice flutamide, an androgen receptor antagonist, Shetty et al. observed stimulation of differentiation in spermatogonia in mice.34 The same phenomenon was detected when GnRH antagonist, decreasing intratesticular testosterone concentration, was used.34 Further, it was revealed that combination of flutamide and GnRH antagonist intensified spermatogonial differentiation, whereas combination of testosterone with GnRH antagonist inhibited spermatogonial differentiation.34 Taken together, it was concluded that testosterone played an inhibitory role in differentiation of spermatogonia through binding to androgen receptor,34 which was substantiated by a further study.35 Moreover, using a Sertoli-cell androgen receptor knockout model, Zhou et al. demonstrated the inhibitory effect of androgen receptor of Sertoli cells in spermatogonial differentiation.36 Therefore, inhibition of testosterone synthesis by Leydig cells might be one of the mechanisms whereby ECM molecules facilitate SSCs differentiation.23-25 In our previous study, we indicated that ECM molecules mediated their differentiative effect on SSCs through upregulation of KIT ligand.23 Further studies are warranted to elucidate the other potential mechanisms contributing to permissive effect of ECM on SSCs differentiation. Evaluating the effect of different types of proteins composing ECM, Diaz et al. indicated that laminin did not influence testosterone production, however, collagen type IV and fibronectin decreased the production of testosterone by Leydig cells.27 Further, investigating the downstream mechanisms whereby collagen type IV reduces testosterone production, Diaz et al. found that the inhibitory effect of collagen type IV was mediated through activating extracellular signal-regulated kinase and decreasing cAMP production and StAR expression.37 The gene expression of StAR has also been revealed to be lower in the ECM-exposed cells compared to unexposed ones in the present study. Collagen type IV was a part of the ECM used in the present study. Therefore, the lower concentration of testosterone in ECM-coated plates could have been originated from inhibition of StAR expression by collagen type IV. Although testosterone production was increased in response to addition of hCG in ECM-exposed and unexposed cells and it was higher at all concentrations of hCG in the control than ECM group, it was shown that cells cultured on ECM-coated plates were more responsive to hCG compared to those cultured on uncoated plates. Gene expression analysis in the present study showed that ECM increased LH receptor expression, which probably contributed to greater responsiveness of Leydig cells cultured on ECM to hCG. Proteoglycans have been shown to modulate testosterone production by Leydig cells in rat.28,29 Factors neutralizing heparan sulfate proteoglycans have been observed to decrease testosterone production in LH-stimulated Leydig cells, suggesting that heparan sulfate proteoglycans have positive impact on testosterone production through modulating LH receptor.29 On the other hand, no significant effect of collagen type IV on the specific binding of hCG to LH receptor was observed in rat.37 Accordingly, the greater responsiveness of Leydig cells to hCG in ECM than control group could have resulted from the modulating effect of heparan sulfate proteoglycan on LH receptor. Indeed, different types of ECM are composed of a great variety of molecules with various functional and structural properties, which give each type of ECM specific capabilities for regulating the function and development of cells.18 In the present study, it was revealed that a combination of laminin, collagen type IV, heparan sulfate proteoglycan and entactin, which were derived from Engelbreth-Holm-Swarm mouse sarcoma, modulated factors contributing to testosterone synthesis and thus impacted testosterone production. Further studies are required to investigate the specific role of each ECM molecule as well as their interactive effect during the process of testosterone synthesis. Furthermore, the downstream mechanisms whereby ECM molecules influence testosterone production need to be elucidated. In conclusion, the present study revealed that ECM decreased testosterone production by Leydig cells, through inhibiting StAR expression. Considering the permissive effect of ECM on SSCs differentiation, inhibition of testosterone production was probably one of the mechanisms whereby ECM facilitated SSCs differentiation. Additionally, it was shown that Leydig cells cultured on ECM were more responsive to hCG, which could have stemmed from the stimulatory effect of ECM molecules on LH receptor expression. The present study was supported by Center of Excellence in Application of Stem cells in Cell Therapy and Tissue Engineering, Faculty of Veterinary Medicine, University of Tehran and Theriogenology Association, Faculty of Veterinary Medicine, University of Tehran. The authors would like to thank Dr. Shiva Shafiei, Dr. Zohreh Mazaheri and Mr. Shahram Pour Beiranvand for their kind assistance in the present study. Oatley JM, Brinster RL. Regulation of spermatogonial stem cell self-renewal in mammals. Annu Rev Cell Dev Biol 2008; 24: 263-286. Tseng YT, Liao HF, Yu CY, et al. Epigenetic factors in the regulation of prospermatogonia and spermatogonial stem cells. Reproduction 2015; 150: 77-91. McLachlan RI, O’Donnell L, Meachem SJ, et al. Identification of specific sites of hormonal regulation in spermatogenesis in rats, monkeys and man. Recent Prog Horm Res 2002; 57: 149-179. Walker WH. Testosterone signaling and the regulation of spermatogenesis. Spermatogenesis 2011; 1: 116-120. Andersson AM, Jørgensen N, Frydelund-Larsen L, et al. Impaired Leydig cell function in infertile men: A study of 357 idiopathic infertile men and 318 proven fertile controls. J Clin Endocrinol Metab 2004; 89: 3161-3167. Rich KA, De Kretser DM. Effect of differing degrees of destruction of the rat seminiferous epithelium on levels of serum follicle stimulating hormone and androgen binding protein. Endocrinology 1977; 101: 959-968. Rich KA, Kerr JB, de Kretser DM. Evidence for Leydig cell dysfunction in rats with seminiferous tubule damage. Mol Cell Endocrinol 1979; 13: 123-135. Singh J, O'Neill C, Handelsman DJ. Induction of spermato-genesis by androgens in gonadotropin-deficient (hpg) mice. Endocrinology 1995; 136: 5311-5321. Meng J, Holdcraft RW, Shima JE, et al. Androgens regulate the permeability of the blood-testis barrier. Proc Natl Acad Sci USA 2005; 102: 16696-16700. Meng J, Greenlee AR, Taub CJ, et al. Sertoli cell-specific deletion of the androgen receptor compromises testicular immune privilege in mice. Biol Reprod 2011; 85: 254-260. Wang RS, Yeh S, Chen LM, et al. Androgen receptor in Sertoli cell is essential for germ cell nursery and junctional complex formation in mouse testes. Endocrinology 2006; 147: 5624-5633. Willems A, Batlouni SR, Esnal A, et al. Selective ablation of the androgen receptor in mouse Sertoli cells affects Sertoli cell maturation, barrier formation and cytoskeletal development. PLoS One 2010; 5: e14168. Holdcraft RW, Braun RE. Androgen receptor function is required in Sertoli cells for the terminal differentiation of haploid spermatids. Development 2004; 131: 459-467. O’Donnell L, McLachlan RI, Wreford NG, et al. Testo-sterone promotes the conversion of round spermatids between stages VII and VIII of the rat spermatogenic cycle. Endocrinology 1994; 135: 2608-2614. O’Donnell L, McLachlan RI, Wreford NG, et al. Testo-sterone withdrawal promotes stage-specific detachment of round spermatids from the rat seminiferous epithelium. Biol Reprod 1996; 55: 895-901. Payne AH. Hormonal regulation of cytochrome P450 enzymes, cholesterol side-chain cleavage and 17 alpha-hydroxylase/C17-20 lyase in Leydig cells. Biol Reprod 1990; 42: 399-404. Stocco DM, Clark BJ. Regulation of the acute production of steroids in steroidogenic cells. Endocr Rev 1996; 17: 221-244. Rosso F, Giordano A, Barbarisi M, et al. From cell-ECM interactions to tissue engineering. J Cell Physiol 2004; 199: 174-180. Schwartz MA, Baron V. Interaction between mitogenic stimuli, or, a thousand and one connections. Curr Opin Biol 1999; 11: 197-202. Taipale J, Keski-Oja J. Growth factors in the extracellular matrix. FASEB J 1997; 11: 51-59. Abbott A. Cell culture: Biology’s new dimension. Nature 2003; 424: 870-872. Zhang S. Beyond the petri dish. Nat Biotechnol 2004; 22: 151-152. Akbarinejad V, Tajik P, Movahedin M, et al. Effect of extra-cellular matrix on bovine spermatogonial stem cells and gene expression of niche factors regulating their development in vitro. Anim Reprod Sci 2015; 157: 95-102. Lee JH, Kim HJ, Kim H, et al. In vitro spermatogenesis by three-dimensional culture of rat testicular cells in collagen gel matrix. Biomaterials 2006; 27: 2845-2853. Lee JH, Gye MC, Choi KW, et al. In vitro differentiation of germ cells from nonobstructive azoospermic patients using three-dimensional culture in a collagen gel matrix. Fertil Steril 2007; 87: 824-833. Vernon RB, Lane TF, Angello JC, et al. Adhesion, shape, proliferation, and gene expression of mouse Leydig cells are influenced by extracellular matrix in vitro. Biol Reprod 1991; 44: 157-170. Diaz ES, Pellizzari E, Meroni S, et al. Effect of extracellular matrix proteins on in vitro testosterone production by rat Leydig cells. Mol Reprod Dev 2002; 61: 493-503. Grudet N, Bonnamy PJ, Le Goff D, et al. Role of proteoglycans on testosterone synthesis by purified Leydig cells from immature and mature rats. J Steroid Biochem Mol Biol 1999; 68: 153-162. McFarlane JR, Laslett A, de Kretser DM, et al. Evidence that heparin binding autocrine factors modulate testosterone production by the adult rat Leydig cell. Mol Cell Endocrinol 1996; 118: 57-63. Mossa F, Jimenez-Krassel F, Folger JK, et al. Evidence that high variation in antral follicle count during follicular waves is linked to alterations in ovarian androgen production in cattle. Reproduction 2010; 140: 713-720. Miller WL. Steroidogenic acute regulatory protein (StAR), a novel mitochondrial cholesterol transporter. Biochim Biophys Acta 2007; 1771: 663-676. Littell RC, Henry PR, Ammerman CB. Statistical analysis of repeated measures data using SAS procedures. J Anim Sci 1998; 76: 1216-1231. Shetty G, Wilson G, Huhtaniemi I, et al. Testosterone inhibits spermatogonial differentiation in juvenile spermatogonial depletion mice. Endocrinology 2001; 142: 2789-2795. Shetty G, Weng CC, Porter KL, et al. Spermatogonial differentiation in juvenile spermatogonial depletion (jsd) mice with androgen receptor or follicle-stimulating hormone mutations. Endocrinology 2006; 147: 3563-3570. Zhou W, Wang G, Small CL, et al. Gene expression alterations by conditional knockout of androgen receptor in adult Sertoli cells of Utp14b jsd/jsd (jsd) mice. Biol Reprod 2011; 84: 400-408. Diaz ES, Pellizzari E, Casanova M, et al. Type IV collagen induces down-regulation of steroidogenic response to gonadotropins in adult rat Leydig cells involving mitogen-activated protein kinase. Mol Reprod Dev 2005; 72: 208-215.